As you are browsing my blog writings, be sure to go to the lower right corner of this first page and use each monthly drop down arrow for previous entries. Please leave comments and memories that you have as well. *Note there are three hidden June entries--use drop down arrow there. 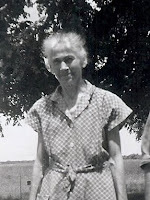 This is a photo of Grandma about 1960 in front of her home in Byron, Oklahoma. If you click on the photo, a larger image will appear. If you do view the larger image, hit the back arrow to return to the writing, or the website will close otherwise. I have so many memories of my maternal grandmother, Lizzie Schwindt. As far as I know, she had no middle name. Grandma was a simple person and a decendent of a family that immigrated to America in the late 1880's. Her parents and family were German decent, but living and struggling with economic/political situations in the pre-war Russia. 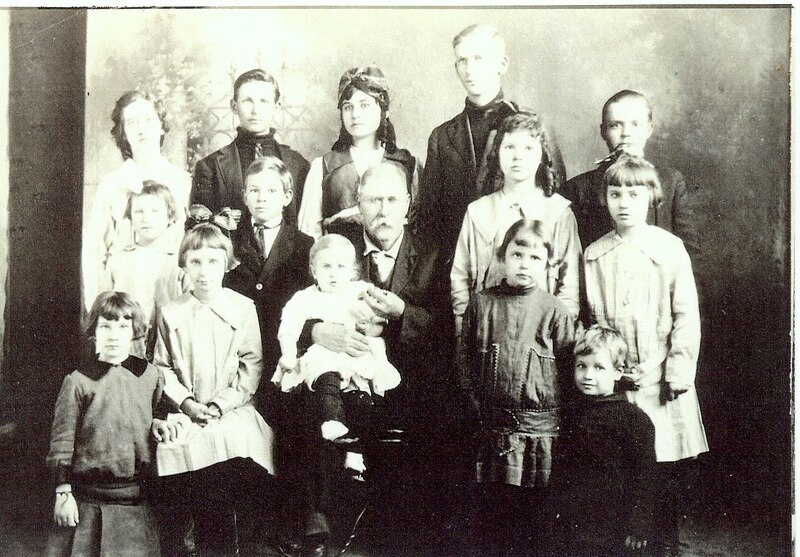 The Russian government had actively recruited German citizens that were farmers and the Schwindt family would be one of those families that chose to accept the invitation earlier in the 1700's as far as our family geneology could record. At that time, the Russian goverment would honor the German citizenship and require no military draft from these German families. But as history would develop and czars, country leaders would change, the military draft to build the strength of the powerful Russian government would finally turn those decisions into active drafts for the young men of the German families. The Germans began to actively seek refuge and new life conditions in the new world, America. One of my grandfather's brothers and soon other relatives were finding their way across the Atlantic. Then finally it happened and the story is told that my Great great grandfather said ,"Today I am losing two sons, one to the army of Russia and one to America". He was correct on both accounts. One son went to the Russian army, and my great grandfather Peter would begin the journey to America. At this time, the family traveled across the Atlantic and entered into the port of New York as far as I can remember. There are some family historical accounts written by my mother and the accuracy of what I remember can be researched, but a lot of what I remember just came from word passed down orally from the generations. My grandma was only 5 years old when she first arrived in the USA. She was born in Norka Russia near the Black Sea in 1881 and I believe they arrived in America in 1886. They would receive their sponsor ship from one of my great grannd father's brother in Iowa I think. This photo is Peter and Christina Schwindt born and raised in Norka, Russia. 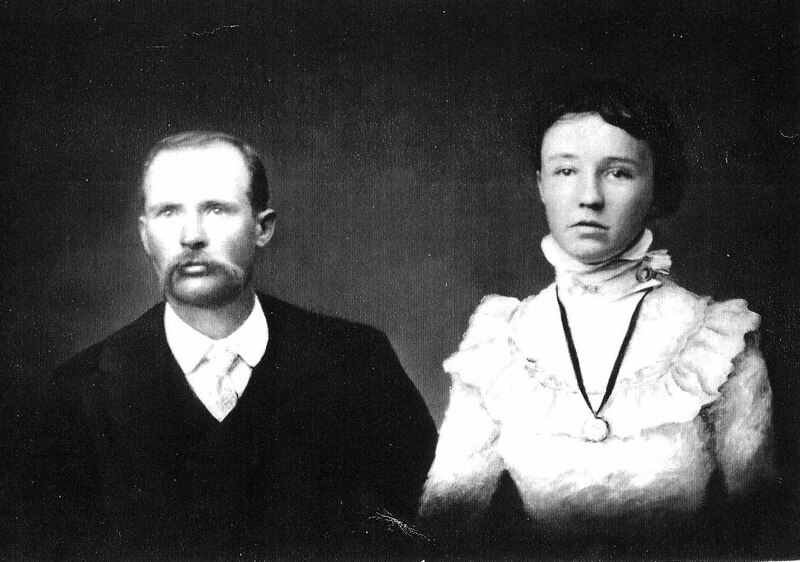 They were my Grandma Lizzie's parents who traveled with their young family to America in 1886. Later, when the Cherokee Strip Land Rush of 1893 would open for homesteaders, my great grandfather Peter Schwindt, speaking no English, would bring his wagon and horses to the Rush near what would be now Cherokee Oklahoma. Fearful of those all around him speaking any other langauage than German, Peter would stay awake all night, scared, watching, nervous and fighting the needed sleep that would follow. The Rush began the next morning, and he would stake a property close to Burlington, Oklahoma that was near a creek. On the left is a photo of the Settle farm in Byron, Oklahoma as it looks today. On the right is a modern photo, but the original land near Burlington, Oklahoma settled by Peter and Christina Schwindt during the Cherokee Strip Land Rush of 1893. Building a sod house with dirt floor, the family began to farm and raise their children. English was still a problem, but they quickly found other German settlers and became members of the German Baptist church near Burlington. Grandma would be exposed to English when she entered the first grade in the public schools. Years later, I remember Grandma always spoke German to her visiting sisters and brother. We never understood what they were saying, but often times just their faces, expressions, voice tonations would give us big clues to the subjects. The Schwindt children spoke Platte Deutsch or Low German. 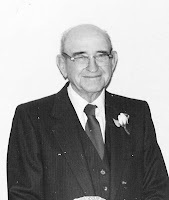 Leroy Burton “Burt” Settle was born July 2, 1887 in Liberty Center Iowa. He was married 46 years to Lizzie (Schwindt) Settle, a German-Russian immigrant. They had two children. Leroy Settle and his sister Lucille Naoma Settle (Stephenson-Merrick). I best remember my Grandpa with his denim overalls, warm tobacco pipe and straw hat that were always with him. When he passed away in 1958, he was buried in the Cherokee cemetery. As far as I know, he never owned a suit, so he was buried in a brand new pair of denim overalls in a quiet ceremony in the Byron, Oklahoma First Christian church. Full of laughter and good stories, we all enjoyed sitting on his lap in the front day room of the farmhouse. We still miss him too! My mother, Lucille, told the following story about her dad, Burt Settle: " To add to the farm supplement income, we sold garden, watermelons etc to people passing by the farm. But,Dad spent the night the watermelon patch all night with a shot gun a lot of times as people tended to steal them and tear up the vines. Even then things happened. One Sunday we saw a big truck loaded with melons just leaving the field and somebody standing holding a melon high for us to see. Dad would have given anybody some melons if they had not been able to pay, they didn't need to steal them. One Saturday, Dad took a load of apples to try to sell. He drove a team and wagon and stopped at a good place. An old man we knew climbed up to sit with him awhile. As they talked, the old man put apples in his coat pocket. He was wearing a big duck coat that had holes in the pockets which allowed the apples to go down into the lining of his coat. When the old man finally got his visit out, and the coat full of apples, so he climbed down. His coat was so heavy with apples that he had a hard time walking off. 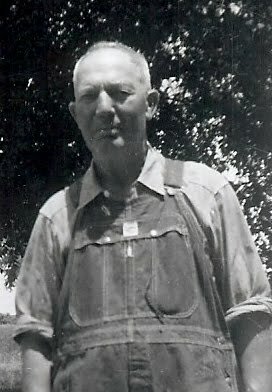 Burt was a farmer all his life and moved to northern Oklahoma farm lands where he finally purchased his first farm in Byron, Oklahoma and raised cattle, wheat, chickens, and garden vegetables. On an early morning of October 1, 1958, Burt passed away sitting out in his pasture watching the cattle graze on his farmland. His son found him shortly afterwards, the pipe still warm in his hand. This photo shows more of the beautiful, rich farmland and pasture in Cherokee County. Burt Settle was the son of David Franklin Settle and Emma (Hoffnern) Settle. David Franklin Settle was the son of James Settle and Eliza (Middleton) Settle. Eliza was the daughter of John Middleton and Elizabeth Downing(Middleton) from Delaware. John Middleton was the son of James Middleton, born 1750, a soldier in the American Revolution from Sussex Co. Delaware. James Middleton died in 1798 and was on the muster roll of Captain Nathan Adams’ Company in the Delaware Regiment, American Revolutiony War. Henry Britton Merrick was the third child born on April 14, 1906 to Sanders Merrick and Ora Boydstun Merrick . Born in the Indian Territory at Range, Oklahoma. Henry was a farmer and rancher in Groom until his retirement in 1974. He was a member of the Groom Church of Christ, where he served as elder and member and past president of the Groom School Board. This is a photo of Henry World War II veteran with the 11th Army Air Corps stationed in the Aleutian Islands. Many years later, he was instrumental in placing a historical marker for Boydstun Cemetery on Highway 70 near Old Jericho in memory of his grandparents, who homesteaded in Boydstun in 1889. Henry’s dad was Sanders Merrick, the third child of Britton A Merrick and Mary Francis Neeley Merrick. Sanders was born in 1874 in Arkansas and when he was eleven years old he came with his parents from Missouri to Round Timbers settlement in Baylor county, Texas. It is thought that he lived in Knot or King County until the death of his mother on January 6, 1897 as she is buried in the cemetery at Gutherie, Texas. After that he worked on ranches, gradually moving westward. Photo left was taken circa 1930 of Henry with his mother, Ora, and his sisters, Ivy, Leta, and Mary. By the late 1890’s, Sanders (Henry's dad) was working on the T6 Ranch, which borders started five miles north of Clarnedon and extended to the edge of the plains. Now, just on the edge of the plains was another homesteader, Henry Boydstun, who in 1887 had filed on the second section north of the T6 Ranch. Mr. Boydstun had come from Tarrant county, about 35 miles south of Forth Worth. Within a few years, several families had moved into the area. This young community was named Boydstun. The Boydstun post office, in the home of John Frasser, was discontinued in early 1940. It seems most likely that the T6 cowboys were watchful for any social events at which they could meet young ladies. It was at a party in the Boydstun Community that Sanders met the 18 year old Ora Boydstun, third child of Henry Boydstun. They were married in Clarendon about one and one-half years later. The newly married couple made their first home in a rock house at the west end of the ranch. Years later, Mr. Wesley Knorpp, owner of the T6 Ranch told that any cowboy who got married was dismissed, but an exception was made in Sanders’ case. In October 1901, the first child, a son, Clarence Johnson was born. He was named Clarence for Papa’s brother, and Johnson for Ed Johnson, a cowboy friend. Not long after this, Papa quit working for the ranch as they had begun selling off some of the ranch land. He bought two sections on the north side of the ranch. The Rock Island Railroad was being built, and was a point a few miles east of the present Groom town site. Papa worked with a team of horses, and helped build the railroad bed. Sometime between then and 1905, he operated a dray (a strong cart or wagon without sides) in Groom. In June 1904, the second child, a baby girl named Leta Violet was born. In 1905 Papa sold the land and other interests he had in Groom and moved to the Oklahoma Panhandle. He filed on a claim near Range, Oklahoma near Guymon. They had the only frame house in the area. The other settlers had sod houses. There was a creek near the home site and once Papa had a mean horse that would back up when Papa started to lead him. One day, the horse started his usual prank of backing up and Papa just let him go off backwards off a bluff into a large pool of water. Mary Ona was the fourth child born May 27, 1908. She was named for her grandmother, Mary Boydstun and for her mother. 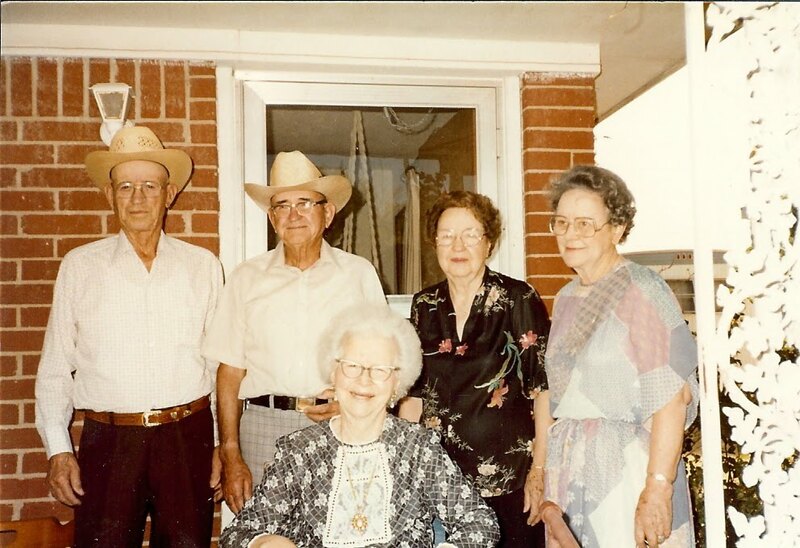 The photo to the left is about 1990-- from left to right is Lawrence Merrick, Henry Merrick, Mary Merrick Knorpp, Ivy Merrick Clark, and sitting is Leta Merrick Phillips. Henry described: "During the stay in Oklahoma, Papa carried the mail between Guymon and Range. It was during this time, that their oldest child, Clarence, at age 5 or 6 had had the misfortune of getting a June bug in his ear. They started to Guymon to the doctor in a buggy and stopped at several houses along the way, each time someone tried to get the bug out of his ear. The bug was finally removed, but his eardrum was permanently damaged and left him with almost total hearing loss in that ear. " "Later, just before the family was to leave Oklahoma and return to Texas, Clarence was sent to the pasture to bring in the horse. He came up behind the horse and surprised him so that the horse kicked Clarence and knocked him out. Awhile later he came to, caught the horse and rode him back to the house. He had been cut on the forehead and was bleeding. A real estate man was there and they took Clarence to the doctor in the real estate man’s car. Clarence said it wasn’t so bad getting kicked by the horse as he got his first ride in a car because of it. " 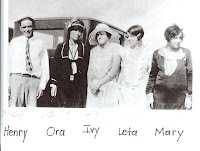 "In 1909 Papa decided to move back to Texas and their fifth child, Ivy Agatha was born in January 1910 in Childress, Texas. " 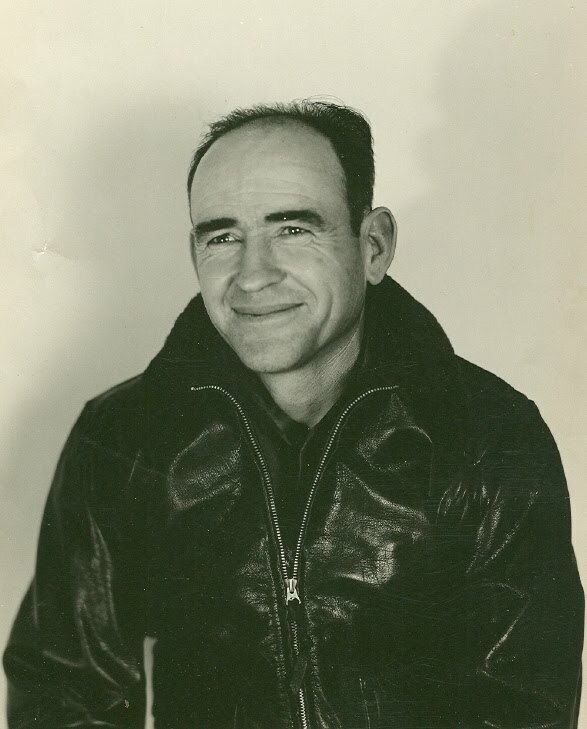 "After moving back to Childress, our parents sent Clarence, probably age 11 and me (age 6) back to the place at Carey to get some harnesses that had been left out there. It was about six miles one way and we walked. 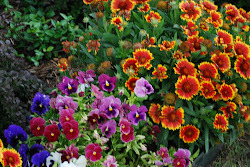 Toward evening there was a rain storm and we stopped at a farm house and spent the night there. The elderly couple was so nice to us. 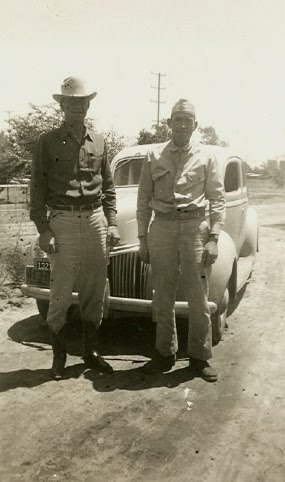 The next morning the water was running alongside the road when we left to g back to Childress." 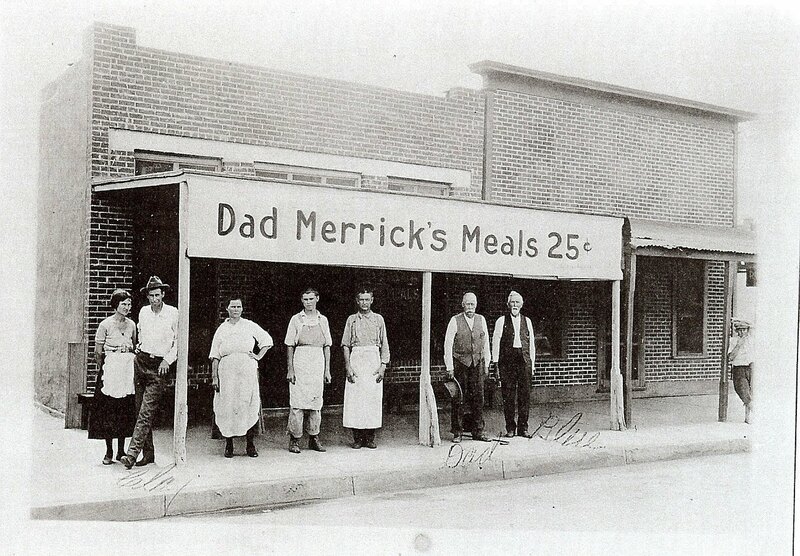 "Granddad Merrick owned and operated a restaurant know as Dad Merrick’s Restaurant. It was a business supported by farmers and railroad people. Granddad always seemed to be just behind me when I needed him the most or was somewhere that I had no business being. I would feel a hand on my head or shoulder. I knew it was Granddad to help me or send me home. However, all was not so good in Childress during these years. There was lost of sickness due to the unsanitary conditions, as a sewer system was mostly nonexistent and of course, there was very little refrigeration. There were epidemics of various diseases. Flags marked the houses where there were such illnesses, and of course, that meant those people were quarantined and no one was allowed to go in or out of those house until the illness was over, or the patient died and the house had been fumigated. A visit to the cemetery would bear out this statement, as there seem to be many graves of children and young adults through the years until about 1920. 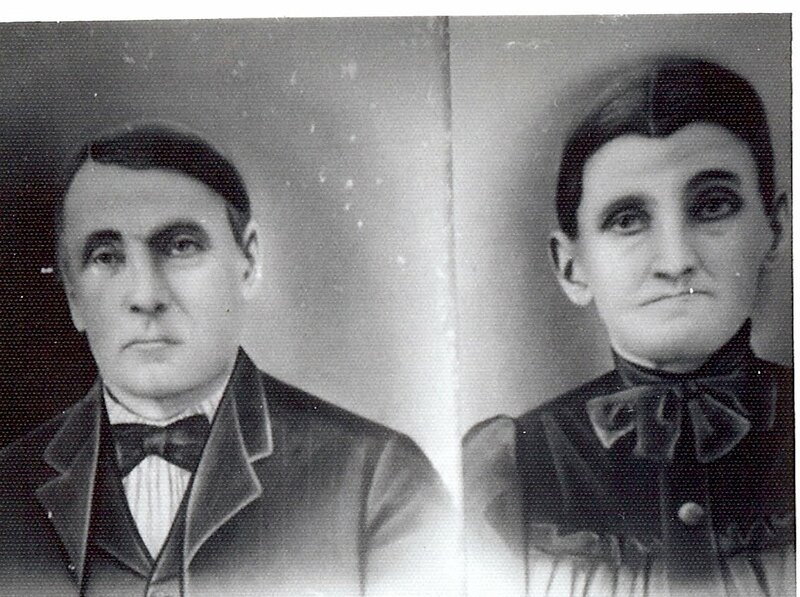 This photo is Ora and Sanders Merrick, Henry's parents. 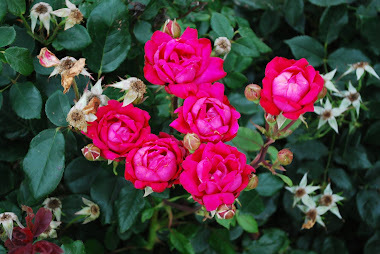 It was in 1912 that our youngest sister, Ivy, then 2 years old, became ill. The doctor had packs on her chest for congestion and she got worse. We heard about a young man, Dr. Morgan, new to Childress, and without a recommended medical reputation because of a drinking problem. It was told that he had quit drinking and probably dependable. Later, he was able to establish a large practice and a hospital. As Dr. Morgan came to see Ivy, the attending doctor was just leaving. Seeing Dr. Morgan, he told him, “There she is” It didn’t take Dr. Morgan long to tell that the swollen abdomen was not due to chest congestion. He discarded the packs and began working with her. He stayed several hours until that had the problem of locked bowels relieved. In 1915 we moved to Hall County and started farming on one of the several farms belongs to Uncle Joe, Papa’s brother. We children started to do the usual work allotted to kids on the farm. I have a clear memory of Clarence and myself in the cotton field. We were supposed to be hoeing the weeds out of the cotton. Clarence always carried a French Harp in his pocket. We’d hoe a bit, and then he’d get out his harp, knock it on the palm of his hand and begin to play. I sat on the ground and listened. He also spent a lot of time filing his hoe, and once he filed notches in it, thinking it would cut the weeds better. Soon after he was filing the notches away, he must have been thinking about a saw. We attended Pleasant Valley School about 3 ½ miles from home. Uncle Joe had grassland leased near Silverton and would drive the cows to the pasture in the spring. I got to go one year and rode on the calf wagon. At night we camped near Red River. There was a hard rain storm with lots of lightening that night and the next morning the herd was so scattered that it took all day to get them together again. The river was up and when the men rode back and forth across the river looking for a place to cross, the horses stepped in holes or were swept off their feet by currents and both horse and ride nearly went out of sight. In 1917 our parents brought a farm 7 miles north of Clarendon near Goldston. It was an extremely dry year and cattle were sent to the plains from An Angelo country. They were so poor that they were barely able to walk, but as they were driven by our place they found the haystack and ruined it in a short time. By the early 1920’s we were living and farming between Lark and Conway. Economic conditions following World War I were bad for everyone in agriculture or ranching operations. There was no government help. Some ranchers were not able to pay out on their operations until almost time for World War II. These were hard years here on the Panhandle Plains for most of the older men that were not able to handle the difficulties—and Sanders Merrick was one of those men.